Less a contribution to Bloom's esoteric theoretical system (The Anxiety of Influence, A Map of Misreading, etc.) than an essay in nervous self-classification--fascinating as such, but excruciating, too, in its twists and turns, its fecklessness. Unsurprisingly, Bloom once again stresses "misprision," "troping," the three elements of "strong readings of belated poems": "negation, evasion, extravagance." He jumps across despised Modernism on the back, now, of Emerson--whom Bloom sees as the foremost American Gnostic (his classification for himself, early on). In opting for pneuma (spark) over psyche (adhesive self--to HB), Emerson made everything dependent on a "reader's Sublime." Where do we find this Sublime? In Whitman, in Hart Crane (the one successful critical examination), in Donald Lindsay's Gnostic fantasy A Voyage to Arcturus (on which Bloom's novel The Flight to Lucifer is modeled), in John Ashbery and John Hollander--all of them in quest of "an illusion of identification or possession; something we can call our own or even ourselves." 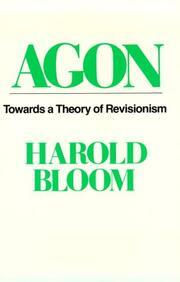 Yet Bloom's attentions are particularly unfocused in this book, perhaps because he is preoccupied with defending himself against antagonists: the deconstructionists, the imaginationists, the Poundians, the lightweights. If anything is distressing here, in fact, it's the scantiness of serious analysis. Gnostics, of course, may not need to analyze: "Loving poetry is a Gnostic passion not because the Abyss itself is loved, but because the lover longs to be yet another Demiurge." Still, the scattershot approach ill suits Bloom's academic formalism--leaving it less defined, rather than more. In the end, one has the nagging suspicion that Bloom is promoting an art so vague, so self-erasing, that only the university critic could have the time and temper to cosset it.